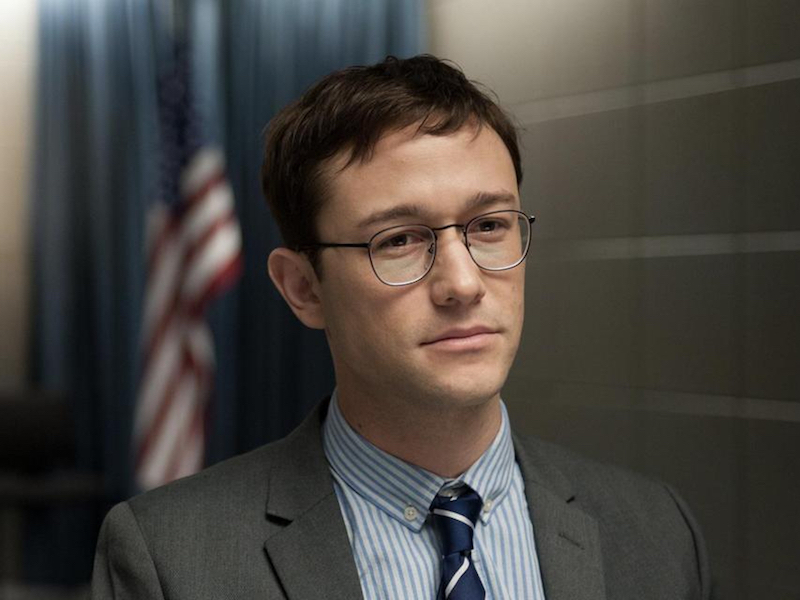 Even the efforts of the eminently talented Joseph Gordon-Levitt aren’t enough to lift this leaden biopic, which strains hard to be about Edward Snowden The Human as opposed to Edward Snowden The Headline. In his effort to humanize the now infamous NSA whistleblower, director Oliver Stone spends far too much of Snowden‘s 140 minute runtime cataloging personal details of its subject’s life in a manner that’s shoddy and predictable from the first scene. Stone’s never been known to be a particularly eloquent dramatist to begin with and his commercially friendly approach to this potentially provocative subject matter adds very little to the international conversation on mass surveillance and privacy in the digital age. The film, which is told largely in a series of drawn out flashbacks, centers around Snowden’s pivotal meeting in Hong Kong as he discloses the classified documents to journalists Glenn Greenwald (Zachary Quinto) and Ewen MacAskill (Tom Wilkinson). As Snowden begins to open up to filmmaker Laura Poitras (Melissa Leo) in their hotel room, we learn about his early training days in the army, his various positions within the intelligence community and the romantic relationship with his photographer girlfriend Lindsay Mills (Shailene Woodley). After the data is eventually leaked to the press, we follow Snowden as he finds temporary asylum in Russia amid staggering criminal charges brought on by the US government. Perhaps I’m a cold hearted person but the fact is that I just don’t care about Snowden’s personal dilemmas and hangups nearly as much as I care about his role as a catalyst for the important public debate that he brought about with his actions. I’m not interested in pointless subplots like one involving Timothy Olyphant as a shady CIA operative and I’m even less interested in the 10 total minutes of screen time that Nicolas Cage has as a squirrelly NSA mentor. As an obsessive filmmaker, Stone is wont to get wrapped up in these kinds of trivial details that obscure the message he’s trying to convey. He clearly wants Snowden’s relationship with Mills to be the heart of the story but Joseph Gordon-Levitt and Shailene Woodley don’t have the kind of chemistry that makes their love believable or worth rooting for. Both have done terrific work in other projects but their interactions here feel so forced and rarely does it seem like they’re emotionally on the same page with one another at any given moment. In particular, their hollow conversations about politics come across as the characters acting as a mouthpiece for the respective political parties they represent rather than resembling any kind of realistic talk that couples might actually have with one another. The only scenes that have any sort of dramatic thrust are those with Snowden, Poitras and the two journalists in the Hong Kong hotel and it’s a shame that there isn’t a movie that focuses solely on these four individuals as they race against news deadlines and a relentless press force that seeks to expose them. Except there is; it’s called Citizenfour and it won Best Documentary Feature at the Oscars last year (it’s even streaming online for free here). If you’re truly interested in this material, you’re much better off watching the vastly superior documentary and leaving Snowden out in the cold.